We are Brian and Tamara Osterman and we own and board a little herd of beautiful Suri Alpacas. We love the animals and adore their exquisite, silky-soft, and ultra warm fleece. Alpacas are wonderful animals...we name them, value them, and all of their fleece is used to produce something unique! We are dedicated to producing our alpaca fleece products with the greatest of care and respect for both the animals and the environment. 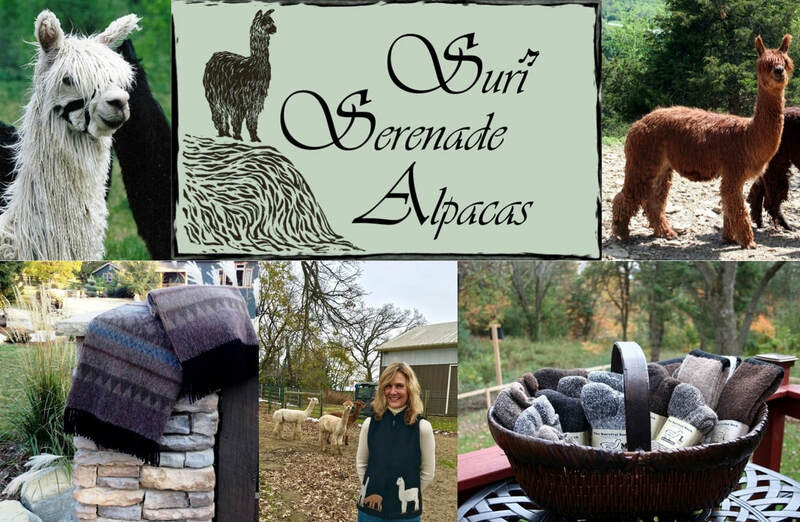 We sell our fine suri alpaca yarn, clothing and accessories at the Stillwater Farmers Market, the annual Christmas at the Courthouse Gala & Bazaar in Stillwater, MN, along with a couple of other local events and on our online store. 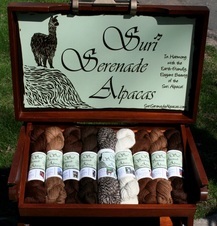 Suri Serenade Alpacas is passionate about the rare suri breed and their simply gorgeous fleece!